Mordecai, newly discovered to be both one of the last living mages and the heir to a small noble family, is trying to rebuild his family estate with the help of his adopted father and his fiancee, Penny. When people start disappearing in the night, Mordecai has to hone the craft of his self-taught magic to face it. But a darker threat looms on the horizon: war. When Penny has a vision that Mordecai will be slain in six months atop his castle walls, it’s confirmation to the rumors. The Gododdin are preparing for their invasion. Using what remaining time is left, Mordecai devotes it to protecting his people even if that means defying his king. Or his fiancee. The Line of Illeniel expands on the world created in The Blacksmith’s Son, building on the magic and history hinted at. Mordecai has to face new problems, including his impending death. Penny’s visions are never wrong. That knowledge provides much of the tension between the characters. How can Mordecai have any hope of the future when his own fiancee is eager to die with him. He wants there to be something left to remember him, like any of us would. Drowning in sorrow, you can feel his pain as he prepares to use his magic to kill thousands. The book mixes wry humor and harsh realities. It flows fast, the emotions bursting off the page, plunging towards the ending. There is one subplot that is given a lot of weight in the beginning and is all but abandoned by the characters in favor of the war, with only a little tease that it’s going to be a much bigger problem in the future. It feels like a plot that could be excised from this book without changing it, but this is a larger part of a series, so I’m hoping for payoff down the road. All in all, if you liked The Blacksmith Son, this gives even more of the characters you come to know and fleshes out a few who didn’t get much time in the last book. On another note, the epilogue and afterward were touching. You can buy The Line of Illiniel from Amazon. Bek’sah of the Ashanti cares nothing for the other peoples of Myrrah, willing to sacrifice all for his ambition to free his people from the goddesses curse and reclaim the power long denied him. But to do that, he needs to cross over into the Spirit World. Lavinia, Darag, Niri, Ria, and their friends will do anything to stop that. The Gate of Water is closed, but three more are still open. The cost to sealing the Fire and Earth gates will be high, but it is better than the Ashanti wiping out all life. War has once again come to the world, and the elementals will have to unite like they never have to face the dark threat of the Ashanti. Friends are divide and enemies now have to unite as the world is thrown into chaos. 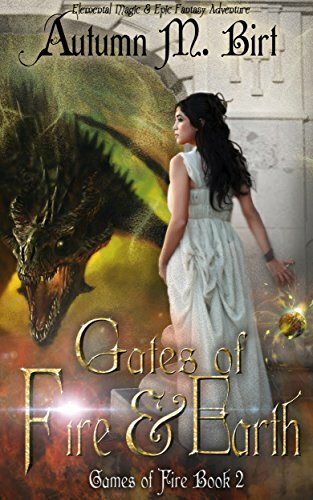 Autumn Brit throws us right back into the action with Gates of Earth and Fire. After the buildup of book one to the explosive new war that descends on the peoples of Myrrah, Book 2 is action-packed. The Ashanti have never been more powerful. The series only gets better as she peels back more layers of her worldbuilding and advances the plot in new and exciting directions. Brit builds on her past four books in this world to catapult the pace of this book forward. The characters have to race against time to deal with the mad Bek’seh. The series continues to be an excellent Indie fantasy read full of vibrant action and delightful characters as they struggle with new and dire threats. I can’t wait to see how Brit will resolves this in the final book! But I am eagerly awaiting it! You can buy Gates of Fire and Earth from Amazon! I received this book as an ARC in exchange for an honest review, though I had planned on buying it before the author sent it to me and have preordered it. Ian Troy is haunted by his past and his abilities. He is a Shinree, a race who can use magic. But magic always comes with a price. To cast a spell, something living has to die. When Ian Troy decides to end the war between his nation, Rella, and the Langorians using the fabled artifact the Crown of Stone, magic’s price goes two far killing both armies and his lover, Queen Aylagar. Ten years later, Troy has vowed to never use magic again. Fear and reviled as the man who killed so many people, he exists as a bounty hunter, staying on the fringes of society trying to forget his guilt. But events are moving again and Troy finds himself embroiled in a plan that will affect all the nations of the world. Once again, Troy will be forced to use magic to protect Rella and his friends as he faces against a Shinree who wants to restore the glory of their enslaved people. A people addicted to magic fed off living creatures’ deaths. Schneider’s writes a fast-paced plot, zooming from one catastrophe to the other as Troy has to react to the machinations of his enemy while trying to protect those around him. He fights against the call of magic, battling it like an alcoholic battling his demons. The only problem—the alcoholic doesn’t need to drink to have the power to protect Rella and those he cares for. Schneider explores the moral question of what to do with a race of beings that has to kill living creatures to fuel their addictive magic. Especially when said magic is so useful from oracles, to healers, to soldiers capable of fighting with more skill, and even teleportation. Should they be enslaved by drugs? Set free? Or exterminated? With magic’s price so high, there are no easy answers as she explores this dilemma through the unfolding plot. The use of first person for a fantasy novel was interesting. It is not often done, but it works great here. She keeps the book entirely from Troy’s perspective and since he is at the fulcrum of the enemy’s plans, it keeps his character right in the heart of the action. If you’re a fan of fast paced writhing, exciting action, and romantic encounters then you’ll enjoy the first in the Crown of Stone trilogy. 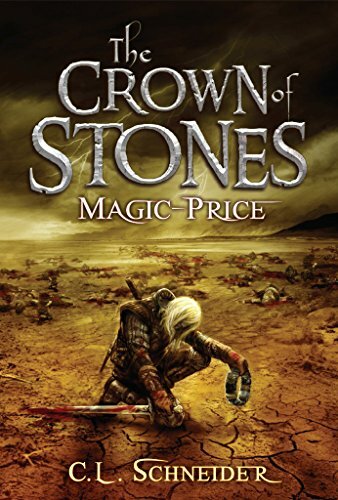 You can buy Crown of Stone-Magic Price from Amazon! Six months after the war that broke the Church of the Four Orders and freed the other temples from Solaire’s control. But the scars remain. Two events, both innocuous and seemingly innocent, spark off a new conflict. When Zhao, an air elemental, returns home to visit his sister. His people fear elementals. Zhao had been kept confined to a shrine, quarantined from his people. When he arrives now that the war is over and elementals should be free, he discovers his new niece is an elemental and the chief of his tribe looks to inflict the same punishment. With his friend Laisseg, he rescues his sister and niece. And sparks off a war between neighboring people. As the war spirals out of control, Zhao seeks help from his friends, pulling Ria from her search for the escaped Sinika, the villain responsible for the war and held as a prisoner for the last six month until his supporters freed him. Meanwhile, Lavinia and her husband Darag have finished their pilgrimage to all the temples to allow Lavinia to touch all the spheres and use all the elements. Wanting to fulfill a promise to the Ashanti Jeif and Leifa, they visit the short-lived and mysterious Ashanti. Their message sparks off a chain of events that could forever change the world. War has returned, but an even great threat looms and the survivors of the last war will have to reunite to stop the new threats to their world. 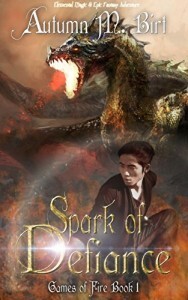 Sparks of Defiance (and the Game of Fire series) is a sequel to her Rise of the Five Orders series. It was great to return to her world and see old characters. The war haunts the characters, particularly the death of Beite. She does an excellent job reworking reminders of the previous plot without exposition dumps. The plot moves fast, keeping you reading. Autumn ratchets up the tension as the book builds to its climax. All your favorite characters that survived the last series are once again in peril. I was on the edge of my seat through the climax. 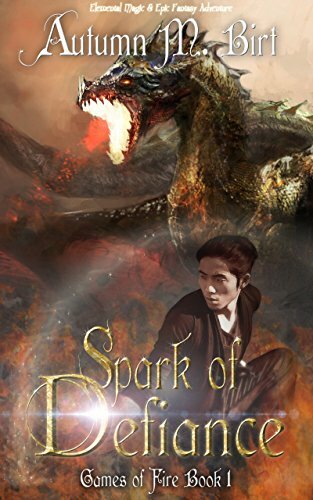 Sparks of Defiance is a great start to another amazing Fantasy series from Autumn. If you enjoy great, fast-paced fantasy, then you’ll enjoy Autumn’s Rise of the Five Orders series and the start to Game of Fire. I am eager for Book 2 to be released. You can buy Spirit of Life from Amazon! On the eve of the Tyran’s attack on a small, Elven village, a Tyran warrior named Villid is approached by a Seer. Villid respects the Seer and listens to the old man’s prediction that cataclysm will befall the world if the Tyrans kill the Elven seer. But the Tyran warleader is bent on exterminating the elves. Villid’s loyalties are torn and he makes a fateful decision. Aya is a young, Elven woman, an acolyte of the Elven seer helping her village get ready for a festival. But horror descends as the Tyrans attack, and Aya finds herself saved by a Tyran warrior. Forced to join with Villid, the pair are hunted by the Tyrans as they search for the Elven seer. But enmity burns in Aya’s heart. Her people were just butchered by Villid’s. Can they work together, or will their races bitter history drive them apart? Blood of the Fallen is a fun read. Villid is torn between his loyalty to his people and his loyalty to the Seer, forced to make a moral decision. Aya starts out as a weaker character, the innocent waif, but she gets her eyes opened by the far more world-wise Villid as the pair are both the hunters and the hunted. The plot takes a number of twists and turns and at the end, I was left wondering what would happen next. Poppy Reid’s first book might not be the most original fantasy plot, but it is written with heart and with characters that you’ll come to care for. I enjoyed this book immensely. Poppy is just starting out, but I know she’ll have a great writing career ahead of her. 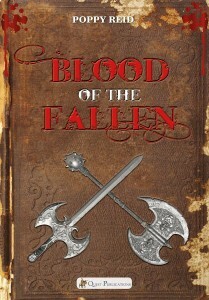 So if you love a fun Fantasy with great characters, you’ll love Blood of the Fallen!